By Cathal Kearney | May 7, 2013. Paul McShane had a day to remember on Saturday by scoring a crucial goal and thus helping his side to achieve automatic promotion to the Premier League. McShane, of Newtown Mount Kennedy in Co. Wicklow, rose the highest to give Hull City the lead against Cardiff City, when he powered home across from fellow Republic of Ireland international Robbie Brady. His goal made it 2-1 to the Tigers, following earlier strikes from Nick Proschwitz and Cardiff’s former Hull striker Fraizer Campbell. Cardiff did manage to salvage a point out of the game, as a stoppage time penalty from Nicky Maynard ensured a share of the spoils. It was a nervous wait for McShane and co. as they watched the Watford-Leeds United game in the hope that Watford would fail to get a result. 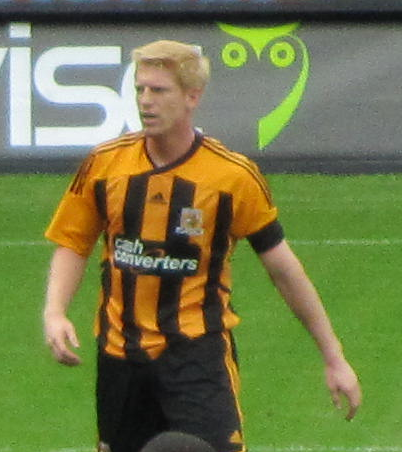 Watford were defeated, resulting in automatic promotion for Hull. McShane has been a virtual ever-present for Steve Bruce’s men at the back, and his international as well as top-level experience has served him well. He may be well down the pecking order in the Ireland set-up but with Premier League football next season, McShane, Brady and Hull’s other Ireland player David Meyler will once again be on Giovanni Trapattoni’s radar.